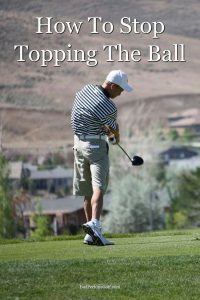 Here are some tips on how to stop topping the ball, along with some drills to help fix the problem. The topped shot is one of the most frustrating misses in the game of golf and unfortunately, it happens to literally everyone. Every so often you will even see a tour player hit a shot that dribbles a few yards off the tee. While you may never completely rid your game of them, it is possible to greatly reduce the amount of topped shots that you hit. In fact, that is precisely the reason that we gather today. Read on for a comprehensive guide on how to stop topping the golf ball. First, what happens when you top the ball? Good question. The topped golf shot is the result of the leading edge of your club striking the top of the ball rather than the bottom. Ideally, at impact, you will strike a descending blow on the lowest part of the ball to give your shots height, spin, and power. Naturally enough, when you fail to accomplish this the results are proportionately disappointing. Topped balls generally fail to get airborne, and only manage to skip a few dozen yards before settling pitifully at an unpredictable location. While the topped shot is always a drag if it only happens everyone and awhile it probably is not going to destroy your round. The problem? Most people that experience topped shots suffer from them far more often than every once and awhile. When you string a few of them together in a round you can’t expect to card a score that you are proud of. Fortunately, this is a swing defect that most players encounter and overcome so without further ado, let’s examine how you can accomplish exactly that. Sometimes the simplest fix is also the best one. Traditionally, the golf ball is to be placed in the middle of your stance. If you find that your ball has drifted a little bit further up, this could very well be contributing to your problem. While there are strategic reasons for placing the ball forward in your stance (such as a higher trajectory or a few extra yards) it can also lead to you striking the golf ball on the upswing which is the exact reason that you might make contact with the top of the ball instead of the bottom. Place the ball a little further back in your stance in order to force your downswing to strike down on the bottom of the ball. Just be careful not to adjust the position to the point that the ball is atypically far back in your stance. A proper golf stance will see that your feet are a shoulder length apart with your feet parallel and your knees bent slightly. Your weight should be distributed almost evenly with the slight majority going to your front foot. Finally, you should bend forward ever so slightly so that your eyes are just over the top of the ball. If you fall out of this stance at any point in your swing, especially when it comes the shifting of your weight or the bending of your knees and spine, you are going to be very prone to topping the ball. Instead, take extra care to ensure that you maintain an ideal athletic stance for optimal results during your swing. I’m a big advocate for proper tempo as it is truly the mechanism that ensures the swing will accomplish what it is supposed to. There are hundreds of different ways to swing the club but in order for any of them to do what they need to the same rhythm is necessary. Proper tempo mandates that you spend three times as long drawing the club back as you do swinging it downwards to the ball. A good way to properly execute this is to think of a three-word phrase as you draw the club bag (Jack Nicklaus used “low and slow”) then choose another word to activate your downswing, such as “go,” or “fire”. Why is this important? A good tempo is going to ensure that your swing is leveling off at the exact right moment so that you hit the ball squarely, the way that you are supposed to. When you start swinging too hard (which is perhaps the very most common swing defect in the game) it throws your tempo off which ultimately leads to unpleasant misses such as the topped shot, so just be sure to take things nice and easy for more consistent results. Another one of the primary causes of topping the ball is moving your head up prematurely during your golf swing. In order to counteract this, you will need to train yourself on the range to keep your head down throughout the duration of the swing. Fortunately, accomplishing this is as simple as one would guess it would be. Simply focus on hitting shots without looking up until you are well into your follow through. As this is a rather basic element of the swing it should transfer over very quickly to the course and sooner, rather than later, you won’t even need to think about it. If you are consistently making your divot after striking the ball it is a good indicator that you are making good contact and that you certainly are not topping your shots. In order to get in the habit of taking good divots you will simply want to place a tee, or another object about an inch in front of the golf ball, and then focus on striking that. It sounds simple I know but I can also tell you that it works quite well. Personally, I favor simple drills as they are the easiest to carry over to the course. Once you leave the range and head out for your loop, simply focus on picking a spot on the grass just ahead of your ball, and you will find that you are naturally making purer contact. The topped shot really is the worst but as you can see it is also really quite simple to fix. If there is one last piece of advice I could impart on you it would be this: just don’t let yourself get frustrated. Golf is more than anything a mental game which means that the moment you allow yourself to get upset things start to unravel. Stay calm, practice the tips and drills listed above, and then say goodbye to topped shots, and hello to lower scores.